This material has had a service run of more than 55 years, and throughout this time it has proven to be tough, elastic, and flexible. 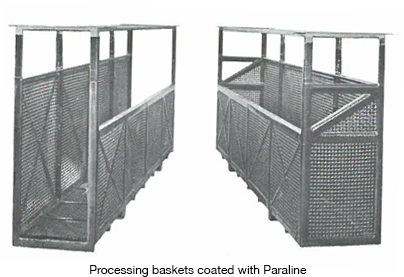 The Paraline™ Process provides a seamless liner which is unsurpassed in chemical and physical properties compared to other plasticized polyvinyl chloride lining products. It also has maximum surface hardness for greater impact and scuff-resistance. It can be permanently bonded to metal surfaces using the exclusive Paraline™ Process. Only The Barber-Webb Co. Inc. in Los Angeles, California, produces the Paraliner, a superior quality cell and tank liner. 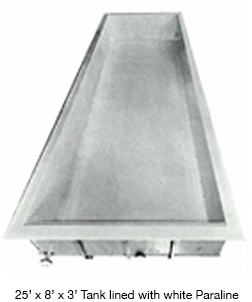 Our Paraliners are custom made to conform to a given cell size and configuration, and can incorporate skimmer weirs, overflow boxes and inlets and outlets, into a one piece, seamless flexible liner. Paraliners can be folded and shipped anywhere, and can be installed in just minutes. 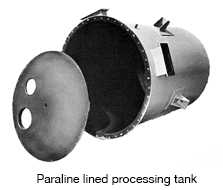 Introduced in 1958, our Paraliner products have become the industry standard, greatly increasing operating efficiency in refining worldwide. Make us your single source for tankhouse solutions, from conceptual planning to system modification, and even for emergency mobilization. Barber-Webb can provide engineering assistance and analyze the corrosion-resistance and chemical handling properties required for your application. Our drafting department can provide shop drawings, along with all of the appropriate details, for submittal and approval, prior to production. Contact us in Los Angeles, California, to have a Paraliner lining or coating custom made for your project.